Sky Building Number 3, previous post here, is now wrapped up and ready. I've never taken the news of demolition of buildings from this era seriously. 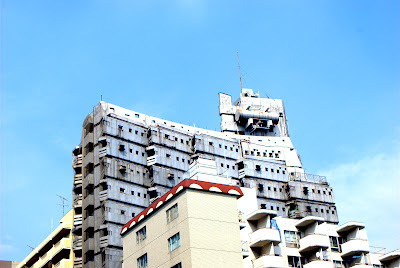 Partly because the Nagakin Capsule Tower always seemed to be under threat of going down. But this wrapping up is ominous. The water filled PET-bottle functions as cat repellent, to avoid cat pee. Usually only along the wall inline with the streets gardens of Tokyo. Here it forms a field, a cat proof area. I don't know how effective this is, to be quite honest. Tamagawa Josui 玉川上水 is an early Edo era water-supply system that still is visible in many places. For map look here to see the full extent of the system. The photos in this post only covers a 1-2km or so of the waterway. But it is an interesting linear feature in the city providing, rich in history and spatial scenarios. Further out west it changes style many times. It disappears under a motorway and reappears with different design. Atelier for a Glass Artist - Shigeru Ban, 2006. Due to excitement of this CNN short about the smallest house in Japan I would like to remind the world of this project. Due to an unforeseen trip the schedule for the upcoming tours has changed. November 20 Meguro-ku. Cost ￥2000 or ￥1000 for students. Starting point, Segafredo next to Nakameguro station (Google map). 11:00-14:00. Similar but not same as Extra architour. December 11, Shibuya-ku West 13:00. Cost is ￥1000 or ￥500 for students. Starting point, McDonalds next to Komaba-Todaimae station (Google map). Shigeru Ban etc. December 18, Setagaya-ku. Cost￥2000 or ￥1000 for students. Starting point, Segafredo next to Nakameguro station (Google map). 11:00-14:00. If want to join, please send me an e-mail (or leave a comment). Shimokitazawa as seen from the 5F floor roof top garden of Kitazawa Town Hall. A dense mess of buildings with some cut off for allowing sunlight. Kitazawa Town Hall - Sakakura Associates, 1990. A complex and contradictionary architecture? 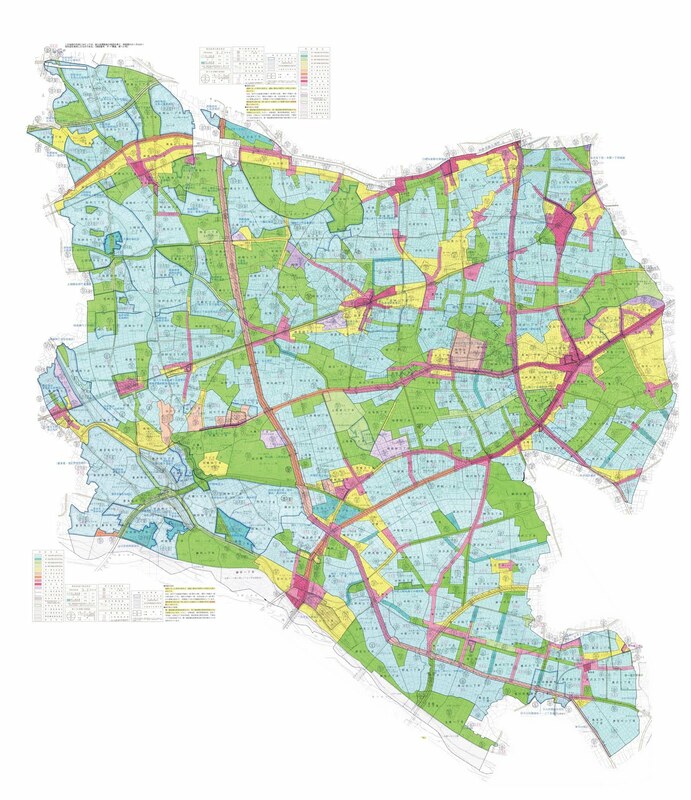 Tokyos Setagaya-ward is subdivided into 4 administrative areas, each sub area has its own office. 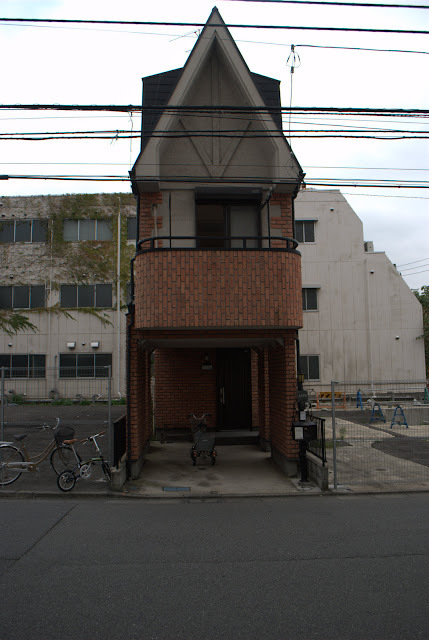 Located in Shimokitazawa this buildings provides a series of programs; public register, exhibition, concert hall, office, bus station, roof garden, parking and so on. A change of tempo along an old shotengai. This house stands out because it brakes the pattern. It is typical but not ordinary. A street garden showcasing a series of techniques for a garden in narrow spaces. hhstyle.com, Kazuyo Sejima, 2000. Changed to Kiddyland in 2010. From Vitra design furniture to Hello Kitty. Architecture can remain even if the program changes. But can minimalism cope with Hello Kitty? How it was before, flickr. Can't seems to find any photos of this that I've taken before. Which is very strange. Sky Building Number 3, Yoji Watanabe, 1970. Architecture inspired by a naval ship design. A lonely house on street where the process of acquiring property has gone far. Tokyo from space. Image courtesy of Earth Sciences and Image Analysis Laboratory, NASA Johnson Space Center. Image id ISS016-E-27586. North is not up. A tale of two cities. One of house and on of buildings. The Chuo-line is the most visible railway line. 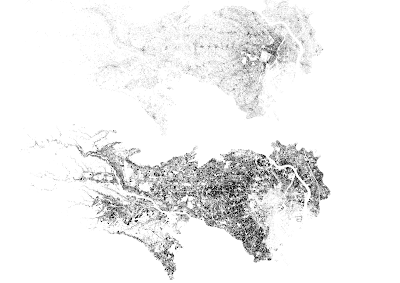 Some rivers, the dense belt of houses in areas developed during the years of extreme growth in the 1950, the shapes of the valleys to the west. North is up. November 6 Setagaya-ku. Cost ￥2000 or ￥1000 for students. Starting point, Segafredo next to Nakameguro station (Google map), 13:00, about 3h. 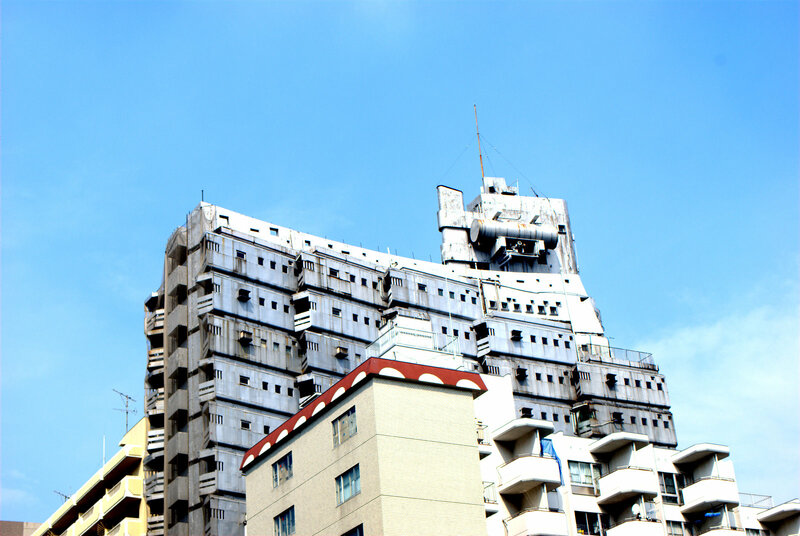 Projects by Kunio Maekawa, Kenzo Tange, Sejima, Kengo Kuma, Toyo Ito, Atelier Bow-Wow. Some roads. Morphology. Confirmed. Weather forecast says partly cloudy 12-18 degrees, 10% chance of rain (updated Thu). To join, send me an e-mail. More about tours here. 利用者:Lincun, Krisgrotius. 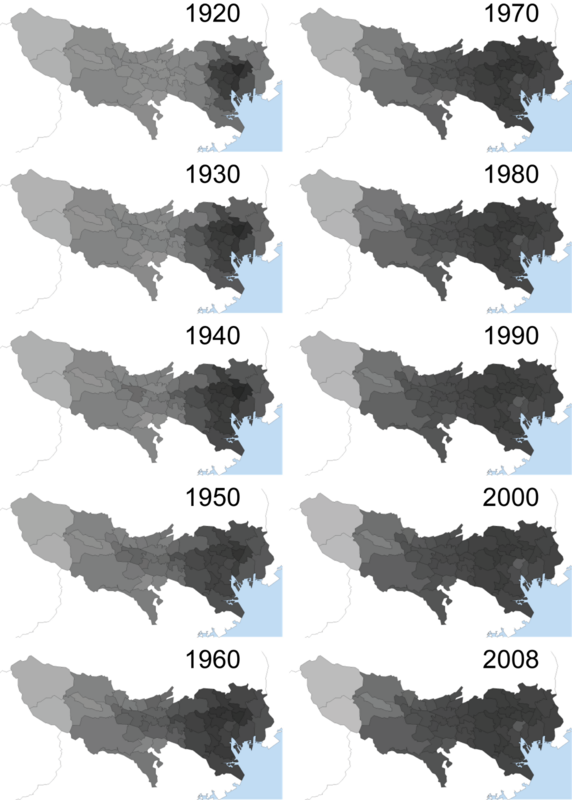 Data from Tokyo Metropolitan Government: Tokyo Statistical Yearbook, here. Persons/Km2, colour scale based on logarithmic plot. SVG file available upon request, Creative Commons 3.0 etc. 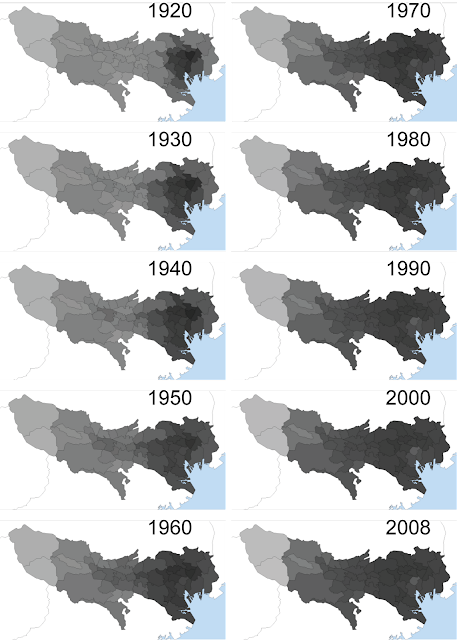 This post is not really about infrastructure, the series will continue but today I present some maps instead. 1 Odakyu-line is for a good part of it route through Setagaya-ku a bridge. This mega structure is built according to future plans for the city. So at surprising places the span between the supports is greater than necessary to accommodate the current roads. This is where the future roads will cross the railway, the precise date for the completion of the road widening is uncertain in many cases. Notes on a place pending change, the houses are occupying this site waiting for a road project to start.